Often dosing equipment is used extensively in combination with robots for fully automated and complex applications. CoDoser™ is a Scanmaster brand with use of a robot for either collaborative work handling of either the dosing process or handling of the units to be filled. The solution is ideal for dosing precisely in large numbers and faster. It involves only a simple set-up combined with easy programming. Investing in experienced robot programmers is not necessary. UR Robot – becomes a CoDoserTM with a Scanmaster Dosing system. 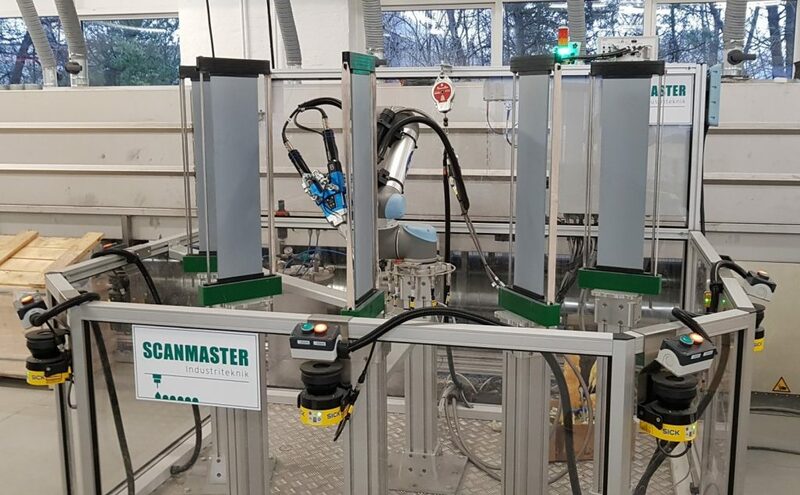 Bila Robotics, the sole distributor of Universal Robots in Denmark, has appointed Scanmaster as their preferred partner for dosing. But we also supply Janome Robots and in collaboration with the customer we find the right solution needed. Ask for more information and see also our webshop. Call us or send an e-mail and discuss your opportunities with Thorbjørn.